Davis Partnership Architects is proud to announce it has become one of the first architectural firms in Denver to be recognized as a certified green business. 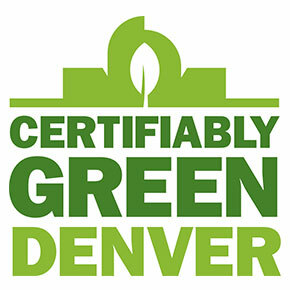 Davis Partnerships’ association with the City and County of Denver’s Certifiably Green Denver program represents a continued commitment to sustainability through design and everyday professional activities. Davis Partnership Architects completed a comprehensive sustainability assessment in the categories of business management, energy efficiency, water conservation /quality, resource management, and transportation. Certified Green Businesses in Denver are leaders in the community who are setting the standard for environmental sustainability. The primary goals of the program are to increase participation and adoption of sustainable practices, to minimize use of hazardous materials, increase profitability, improve energy efficiency, promote water conservation, and decrease the use of resources and generation of waste.